The present studies were initiated to determine the protein expression patterns of fibroblast-like synovial (FLS) cells derived from the synovia of rheumatoid arthritis patients. 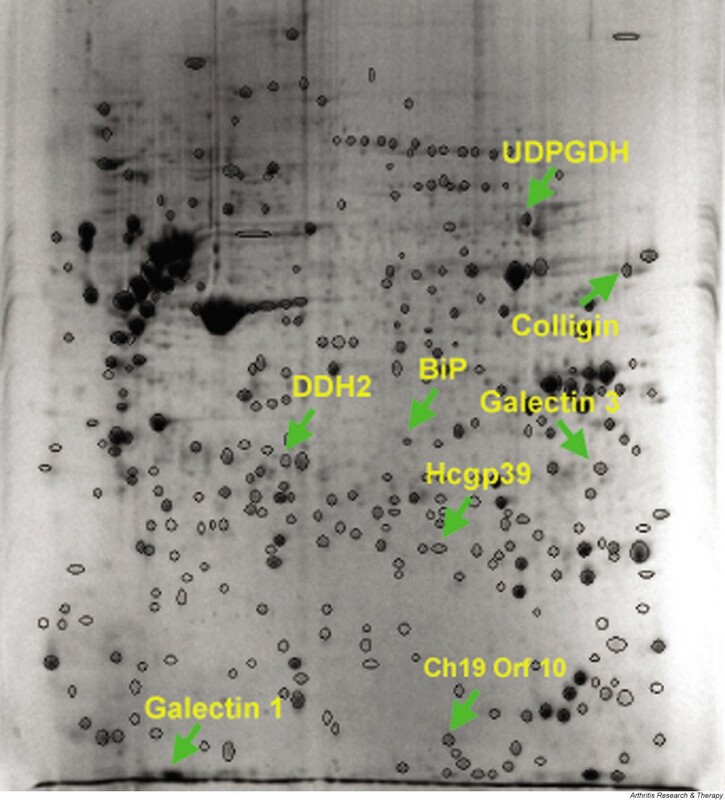 The cellular proteins were separated by two-dimensional polyacrylamide gel electrophoresis and the in-gel digested proteins were analyzed by matrix-assisted laser desorption ionization mass spectrometry. A total of 368 spots were examined and 254 identifications were made. The studies identified a number of proteins that have been implicated in the normal or pathological FLS function (e.g. uridine diphosphoglucose dehydrogenase, galectin 1 and galectin 3) or that have been characterized as potential autoantigens in rheumatoid arthritis (e.g. BiP, colligin, HC gp-39). A novel uncharacterized protein product of chromosome 19 open reading frame 10 was also detected as an apparently major component of FLS cells. These results demonstrate the utility of high-content proteomic approaches in the analysis of FLS composition. The synovial membrane is a thin lining layer within the joint cavity that is responsible for maintaining normal joint function and homeostasis. Within the synovial membrane, the cells most closely associated with this homeostatic function are the normally highly synthetic fibroblast-like synovial (FLS) cells. These are the primary source of articular hyaluronic acid and other glycoproteins such as lubricin [1, 2]. In chronic inflammatory disorders such as rheumatoid arthritis (RA), the synovial membrane becomes the target of a persistent inflammatory process that leads to fundamental changes in the phenotype and function of FLS cells. Although the pathogenesis of this phenotypic change remains uncertain, available data suggest that this may involve the acquisition of a combination of increased proliferative potential and resistance to apoptosis . This leads to a marked increase in the number of FLS cells in the synovium. These FLS cells participate in complex autocrine and paracrine activation networks with macrophages, lymphocytes, and dendritic cells, which serve to sustain the synovitis and to enhance its destructive potential. Studying the characteristics and behavior of FLS cells in vitro has generated much of the understanding of the phenotypic changes they undergo in RA. The relative ease with which RA FLS cells proliferate in culture has greatly facilitated such studies. Indeed, the behavior of these cells in culture shares many similarities with that of cancer cells, and the concept of a 'transformed' phenotype has been applied to RA FLS cells . The fact that after multiple cell passages RA FLS cells appear to adopt a more benign phenotype that resembles other fibroblasts has led to the suggestion that the transformed phenotype is induced by the intense cytokine and growth factor stimulation to which FLS cells are exposed in the RA synovial microenvironment . The ability to apparently reinduce this phenotype with cytokine stimulation supports this contention. It remains unclear whether RA FLS cells in culture represent a single population of cells derived from the synovium that are capable of extensive phenotypic deviation, or whether RA FLS cells represent heterogeneous populations of cells, with expansion of specific subpopulations depending on the microenvironment. It seems that the latter possibility is the more probable . Microarray-based analysis of mRNA representation has been used extensively to examine cells and tissues from normal and pathologic sites. The approach is very sensitive and it is amenable to adaptation for high-throughput analysis . However, several studies have demonstrated a poor correlation between the levels of mRNA and the actual expression levels of the corresponding gene products . This was found to be particularly problematic in the cases of low abundance mRNA species. A comparative analysis of mRNA and protein levels in synovial tissues derived from osteoarthritis patients and RA patients recently highlighted this problem . Protein expression was monitored using a western blot-based approach in which a commercial array of 791 antibodies was used to probe SDS-PAGE-separated extracts from these tissues. A total of 260 antigens were detected, of which 29 proteins were upregulated and 42 were downregulated in the RA sample relative to the osteoarthritis sample. The authors noted that only 28% of the changes observed in these proteins correlated with those detected in the mRNA analysis. These results highlight the importance of confirming gene expression data with direct quantitation of protein levels. Proteomic approaches employ mass spectrometry and bioinformatics to identify proteins [10, 11]. In peptide fingerprinting, proteins are digested with enzymes with a known cleavage pattern. The locations and masses of the peptides of any protein sequence (real or hypothetical) can thus be accurately predicted. For example, trypsin cuts peptides C terminal to an arginine or lysine residue. The masses of the individual peptides from a digest of an unknown protein can be determined by mass spectrometry. The peak lists are used to search sequence databases to identify those proteins that match the observed fragment patterns. Using statistical-based bioinformatic approaches it is possible to use the data to identify proteins with a high level of confidence [12, 13]. Proteins can be post-translationally modified in a number of ways that are not reflected in the mRNA. In a two-dimensional analysis of the yeast proteome using narrow isoelectric point range analysis, it was suggested that there could be as many as 20,000–30,000 proteins . This represents approximately threefold to fivefold more than the number of open reading frames (ORFs) present in the yeast genome (6139 ORFs). These observations highlight the importance of direct protein analysis of pathological samples. Proteomic analysis undertakes providing a complete characterization of all of the species of proteins in the target cell or tissue. This not only provides a direct indication of what species are expressed, but there is also the potential to examine post-translationally modified species. The present studies were initiated to determine the protein expression patterns of FLS cells derived from the synovia of RA patients. The cellular proteins were separated by two-dimensional polyarylamide gel electrophoresis (2D-PAGE) and the in-gel digested proteins were analyzed by mass spectrometry. Several categories of proteins were identified: those proteins involved in FLS function in health and disease, those proteins that have been characterized as potential autoantigens in RA, and novel protein species not previously described in any cell type. Synovial tissue was obtained from RA patients undergoing total knee arthroplasty. All samples were obtained according to the guidelines approved by the Ethics Committee of the University of Manitoba. All patients met American College of Rheumatology criteria. FLS cells were isolated as previously described . Briefly, synovial tissue was dissected from the connective tissue, and digested for 1–2 hours at 37°C with collagenase (1 mg/ml) and hyaluronidase (0.05 mg/ml) (Sigma Chemicals, Oakville, Ontario, Canada) in Hank's buffer (ICN Biomedicals, Costa Mesa, CA, USA). Cells were washed with modified DMEM medium (supplemented with 1 mM sodium pyruvate and 0.1 mM nonessential amino acids) containing 10% fetal bovine serum and collected by centrifugation at 800 g for 10 min. Cells were cultured overnight, at 37°C in a humidified 10% CO2 environment. The nonadherent cells were discarded and the adherent cells were cultured in fresh medium. Once the cell layers were confluent, they were trypsinized and subcultured. Cells were used between the second and fourth passages. Confluent synovial cells were washed once with Hank's buffered saline and removed with trypsin. The cells were collected by centrifugation at 800 g for 10 min and washed twice with PBS and once with isotonic sucrose solution (0.35 M) to remove the contaminating salts. The cell pellet was dissolved in a sample buffer containing 7 M urea, 2 M thiourea 4% CHAPS, 0.3% (w/v) Bio-lyte ampholytes (pH 3–10) and 75 mM dithiothreitol along with complete protease inhibitor cocktail (Roche Molecular Biochemicals, Laval, Quebec, Canada). Protein levels were determined using a modified RC DC protein assay kit (BioRad Laboratories, Mississauga, Ontario, Canada). Preparative 2D-PAGE was performed on 1 mg total cellular protein dissolved in sample buffer. Immobilized pH gradient strips (17 cm, pH 3–10, nonlinear) were rehydrated overnight with sample in an IEF protean cell (BioRad) at 50 V. Electrofocusing was carried at 9000 V as the upper limit for a total 60 kV hours. Prior to analysis in the second dimension, separated proteins in the strips were reduced for 20 min at room temperature with 50 mM Tris (pH 8.8), 6 M urea, 2% sodium dodecyl sulfate, 20% glycerol and 2% (w/v) dithiothreitol, and then alkylated with same buffer containing 2.5% (w/v) iodoacetamide for 20 min. Second dimension electrophoresis (SDS-PAGE) was carried on 12% SDS-PAGE gels (18.5 cm × 20 cm, 1 mm) (25 mA/gel at 20°C) using the PROTEAN II XL system (BioRad). Gels were fixed and stained using colloidal Coomassie blue G250 (Pierce Biotechnology, Rockford, IL, USA). Gels were scanned and documented with Phoretix image analysis software (Perkin Elmer Life Sciences Inc., Boston, MA, USA). Spots were manually excised, destained and in-gel digested with trypsin . Peptides were recovered by extracting the gel pieces with 25 mM ammonium bicarbonate containing 0.1% trifluoroacetic acid and 40% acetonitrile. The extracts were lyophilized and dissolved in 10 μl of 0.1% trifluoroacetic acid and 10% acetonitrile. Samples were mixed with an equal volume (0.5 μl) of 16% dihydroxybenzoic acid in 50% acetonitrile, deposited on a matrix-assisted laser desorption ionization (MALDI) target and air-dried. The digests of individual spots were analyzed by an in-house constructed MALDI quadrupole time of flight mass spectrometer . Peak lists were generated using Knexus Automation (Proteometrics Canada, Winnipeg, Manitoba, Canada) and samples were identified using ProFound  with National Center for Biotechnology nonredundant human databases. Search parameters allowed for one missed cleavage site with partial oxidation of methionine residues. A mass tolerance of 20 parts per million was routinely used. The intent of these studies was to acquire information regarding the protein expression patterns of typical RA FLS cells. A total of four samples derived from two patients were analyzed for these studies. The cells were cultured for two to four passages and grown to confluence, at which point they appeared to be exclusively fibroblast-like based on their morphology and on immunochemical staining for uridine diphosphoglucose dehydrogenase. The cells were harvested directly without trypsin by directly solubilizing them in sample buffer. Total cell lysates were separated on nonlinear immobilized pH gradient strips (pH 3–10) and fractionated in the second dimension on large-format SDS-PAGE gels. The separated proteins were visualized by staining with colloidal Coomassie blue. The spots were excised, destained and digested in gel with trypsin. 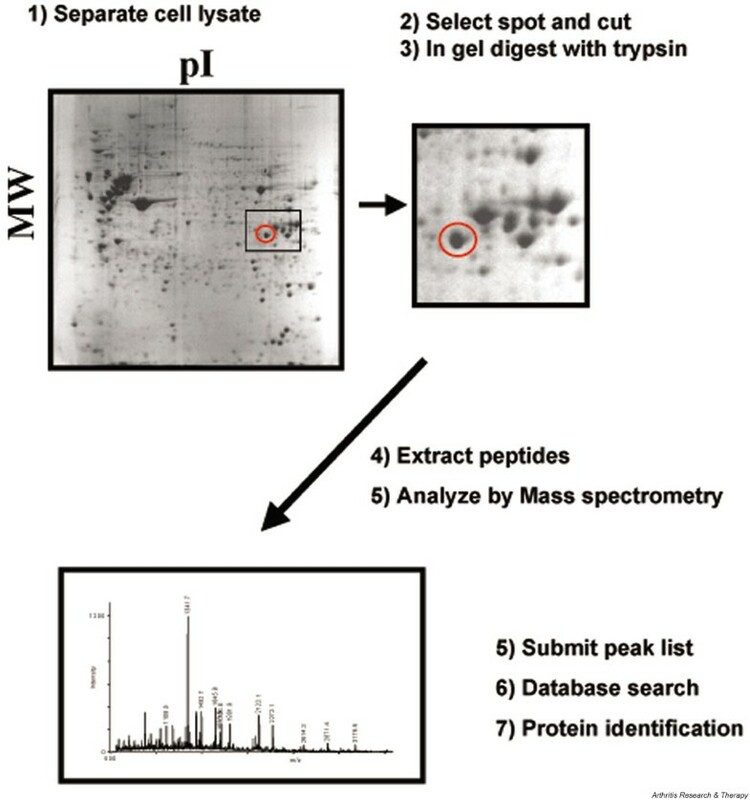 The peptides were extracted and analyzed by MALDI mass spectrometry (Fig. 1). In excess of 1500 spots were detected with Coomassie Blue (Fig. 2). The two-dimensional patterns for FLS cells presented in the present article are representative of the results of several samples, and the patterns were found to be highly reproducible. Schematic of the method used for the separation and identification of fibroblast-like synovial cellular proteins. MW, molecular weight; pI, isoelectric point. A representative example of a two-dimensional separation of fibroblast-like synovial cellular proteins. Spot numbers correspond to identifiers in Additional file 1. Protein identification of the components in a spot was based on the matching of the observed mass to charge ratio of the tryptic fragments of the protein with the predicted values derived from theoretical digests of all proteins in the nonredundant human database. This fingerprinting approach is dependent on high mass accuracy measurements and on relatively simple protein mixtures in a given digest. While there may be several molecular species in a single spot, two-dimensional separation markedly reduces the sample complexity in a given spot making this approach feasible. The instrument employed in the present study has extremely high mass accuracy (10 parts per million) and resolution (10,000 full width at half maximum), making the approach feasible without liquid chromatography separation of the spot digests. Representative MALDI mass spectrometry spectra are provided in Fig. 3. These properties allowed us to obtain identifications with a very high level of confidence (expectation values of 10-3 or less). 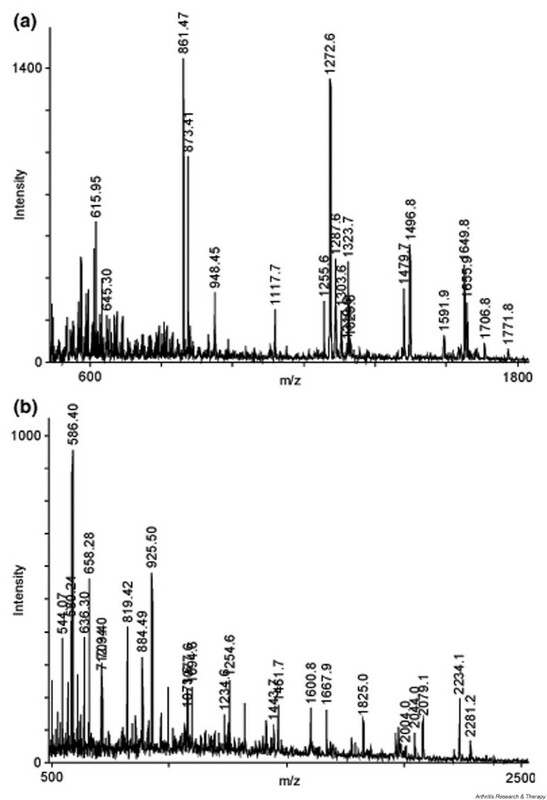 Representative examples of matrix-assisted laser desorption ionization quadrupole time of flight mass spectrometer spectra of samples digested in gel with trypsin. (a) Galectin 3 and (b) DDAH2. A total of 368 spots were selected for mass spectrometric analysis. The spots were selected based on their intensity of staining. Approximately 70% of the spots (n = 254) were identified with 15–90% coverage of the protein sequence detected. In total, 192 distinct proteins were identified because of the redundancy of the proteins in the gel (Additional file 1). This duplication of protein representation derives from the fact that a single protein can undergo multiple post-translational modifications with each species displaying a different electrophoretic mobility. Examples of this are shown in Fig. 4 for lamin (280 spot series) and for vimentin (215 spot series). In other cases, isoforms of the same protein display slightly different mobilities due to amino acid sequence differences (e.g. 237 spot series of actin). Detail of an area of a two-dimensional gel of separated fibroblast-like synovial cellular proteins. 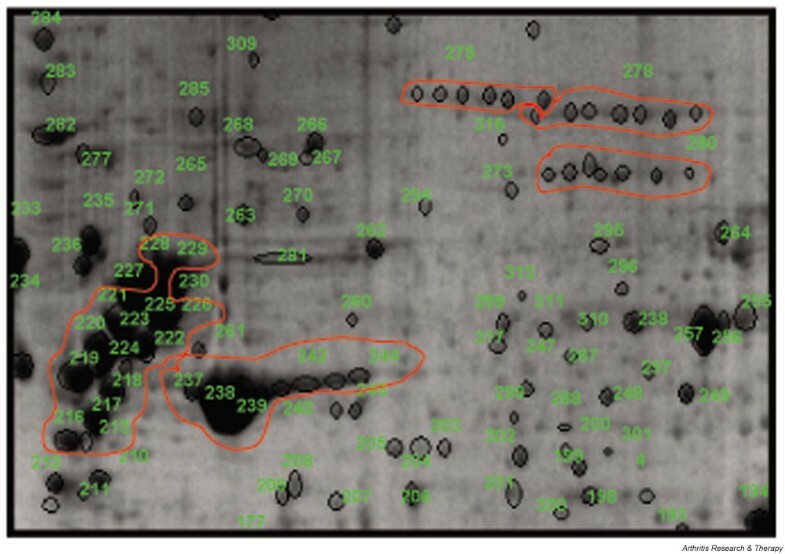 The circled areas include the same species of proteins with different mobilities reflecting differences in isoelectric points due post-translational modifications: 215 spot series, vimentin; 237 spot series, beta actin; 278 and 280 spot series, lamin A/C; 279 spot series, caldesmon. The theoretical molecular weight and the isoelectric point can be calculated for a protein based on the amino acid sequence. This information can then be used to narrow database search parameters. However, a comparison of the theoretical and observed values of these parameters for all of the identified proteins indicates that although there is generally a strong correlation between values, there are some clear discrepancies (Fig. 5). These results highlight the need for caution in using theoretical values of protein properties as a component of the search parameters for protein identification. These parameters were not used in our analysis. 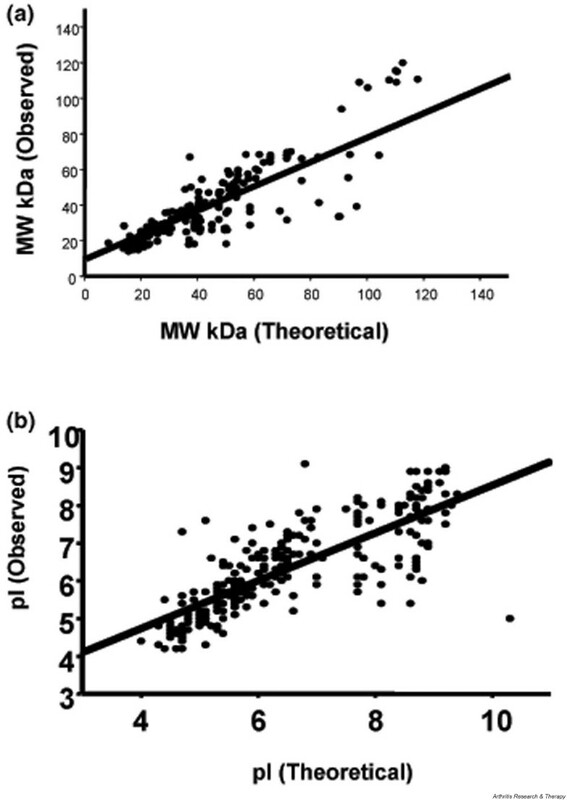 A comparison of the theoretical and observed (a) molecular weights (MW) and (b) isoelectric point (pI) values for the synovial proteins identified in these studies. Note the poor correlation between the expected and the observed values. The FLS cellular proteins that were identified could be broadly classified into several functional categories (Fig. 6). It should, however, be apparent that there can be significant functional overlap such that a single protein species may be involved in several different aspects of cellular function. This type of categorization is thus a very general guide not an absolute assignment of function. Accepting these limitations, the predominant functional groups represented in identified proteins were involved in aspects of cell structure (cytoskeleton), of signaling, of metabolism or of transcription translation (Fig. 5). Functional categorization of the fibroblast-like synovial proteome based on Swissprot and Tremble assigned functions. Analysis of the FLS cellular proteome identified a number of proteins involved in the normal functions of these cells, in particular the cytosolic enzyme uridine diphosphoglucose dehydrogenase. This enzyme is critically involved in the synthesis of hyaluronic acid, which is a major secretory product of FLS cells needed for the maintenance of joint fluid viscosity and the health of the articular cartilage. We have previously  identified this enzyme histochemically in the synovial lining layer, as have Edwards and colleagues , and have demonstrated that its expression levels appear to decrease in highly inflamed RA synovium . HC gp-39 is a major secretory protein of FLS cells, macrophages and chondrocytes . Although HC gp-39 displays structural homology with members of the Family 18 chitinases it lacks enzymatic activity, raising questions as to what the mechanism of action might be. Based on the cellular sources and sites of production of HC gp-39, it has been suggested that the protein may be involved in tissue repair and remodeling or possibly in innate host responses to pathogens containing chitinous elements . HC gp-39 is of relevance, in the context of RA, because peptides derived from it are stimulatory for T cells derived from some patients. The injection of the intact protein into BALB/c mice was associated with induction of arthritis [23, 24]. BiP is a member of the heat shock protein 70 family of chaperones . Similar to other members in the family, BiP plays a central role in the proper folding and assembly of proteins. Under conditions of misfolding or endoplasmic reticulum accumulation of proteins, the levels of heat shock protein can be upregulated to accommodate the load. Recent studies in RA have demonstrated that BiP can function as an autoantigen for both antibody and T-cell responses [26, 27]. Immune responses to BiP have also been observed in experimental models of arthritis. Furthermore, pretreatment of animals with BiP prior to induction of adjuvant or collagen-induced arthritis can reduce the severity of disease in these animal models. These results suggest that there may be some association between BiP responses and RA. Both galectin 1 and galectin 3 were identified in FLS proteome. The galectins are animal-type lectins that share a common carbohydrate-recognition domain, which recognizes galactose-containing ligands . Several members of the galectin family have been shown to have profound effects on cell survival and they have been implicated as major regulators of inflammatory responses . Recombinant galectin 1 inhibits a number of experimental autoimmune diseases, including collagen-induced arthritis . In contrast, galectin 3 has antiapoptotic activities and it can stimulate fibroblast proliferation . Galectin 3 has also been reported to promote monocyte chemotaxis. It is clear that the activities of the galectins vary markedly depending on the responding cell type. Thus it is difficult to predict the impact of these molecules alone or in combination on FLS cell functions. Recent reports demonstrated the presence of galectin 1 and galectin 3 in the synovial tissues of RA patients [32, 33]. Galectin 3 was widely distributed in the synovium, with clear accumulations at sites of cartilage invasion . In contrast, galectin 1 appeared to be excluded from the sites of invasion. These results raised the possibility that the galectins were modifying cellular functions associated with different processes in the RA synovium. Protein methylation is thought to represent a mechanism for regulating protein turnover and function. Some of the degradation products from these modified proteins, NMMA and ADMA, are inhibitors of nitric oxide synthase . The enzyme DDAH2 removes aminomethyl groups of methylarginines by catabolizing them to citrulline and methylamines. Previous studies of DDAH2 expression indicated that the enzyme was widely distributed in normal adult and fetal tissues . Recent studies suggest that Nω-Nω-dimethylarginine dimethylaminohydrolase (DDAH) levels are reduced in a hypoxia-induced rat hypertension model . Overexpression of DDAH in endothelial cell lines also results in enhanced expression of vascular endothelial growth factor providing a link for neovascularization of the synovium . Collectively the results suggest that DDAH plays a critical role in vascular function and development. Based on the present results it appears that DDAH2 is a major product of cultured FLS cells, raising the possibility of a role for this enzyme in the RA synovium. The product of chromosome 19 ORF 10 was originally identified as a product of bone marrow-derived stromal cells and designated as IL-25 . The published descriptions of the biological activity of the protein were subsequently retracted and the official designation of the protein is now a product of C19 ORF 10 . There are also suggestions of an IL-27 designation but this is not consistent with what has been described in the literature as IL-27 . Although the mRNA of the C19 ORF 10 gene is widely expressed, it does not appear to be lineage restricted and it remains unclear as to what the biological activity of this protein is. Based on the staining intensity the protein is well represented in lysates of synovial cells, suggesting that it may be a significant product of FLS cells. The molecule clearly warrants further investigation. 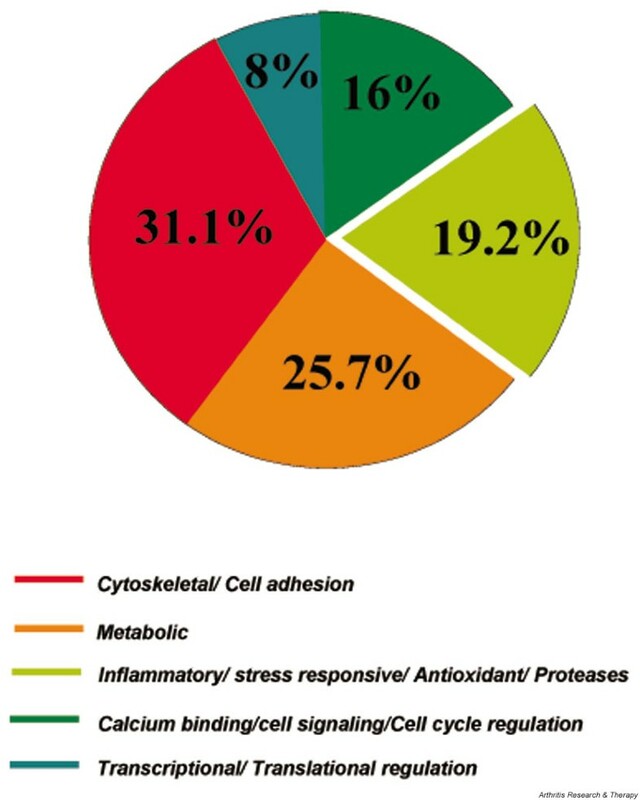 The present studies provide a preliminary analysis of the synovial proteome. It should also be appreciated that the current analysis describes only the major FLS cellular proteins. Future studies will require the development of enrichment steps for low abundance proteins. Despite these limitations, the results have identified a number of novel molecular species that may contribute to inflammatory events in vivo (Fig. 7). The data also suggest that FLS cells may be reasonable surrogates of their in vivo counterparts for compositional and functional analysis. The in-gel locations of synovial proteins of potential functional or pathogenic significance in rheumatoid arthritis. UDPGDH, uridine diphosphoglucose dehydrogenase. The authors thank Ms Sheryl Hagenstein for her assistance in the preparation of the manuscript. This research was supported by grants from the Canadian Institutes for Health Research (HEG, JAW), from the Manitoba Health Research Council (HEG, JAW), and from the Canadian Arthritis Network.